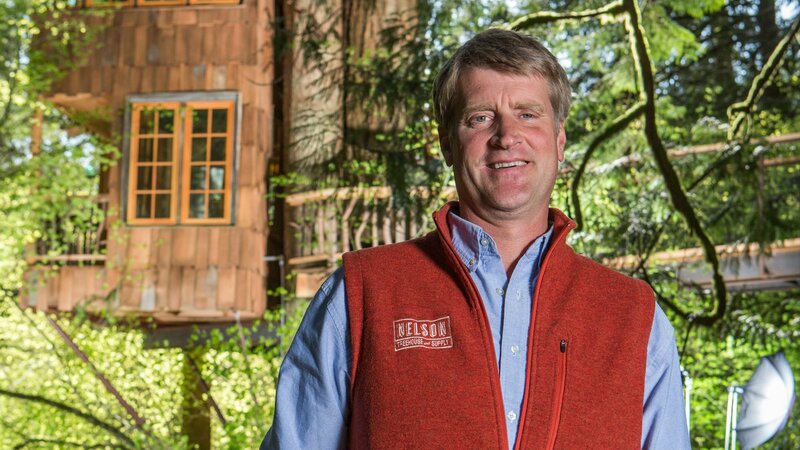 Join Pete Nelson as he designs treehouses for those with a passion to reconnect with nature. Pete creates a guesthouse for his clients' daughter, who is returning from college. Pete designs a treehouse with a barbecue patio, a living room and other fun surprises. Pete transforms a cedar tree into an uplifting retreat for a writer in Rhinebeck, N.Y.
Pete constructs an over-the-top spa treehouse on a Texas entrepreneur's ranch retreat. Pete builds a ranch-style treehouse in several hackberry trees for a Texas couple. An engaged couple wants a treehouse to use for their wedding and honeymoon. Pete constructs a barn-themed treehouse tavern on an Ohio family's sprawling rural property. Pete constructs a Celtic-themed cottage in a California family's backyard olive tree.